Efficient conduction of water inside leaves is essential for leaf function, yet the hydraulic-mediated impact of drought on gas exchange remains poorly understood. Here we examine the decline and subsequent recovery of leaf water potential (Yleaf), leaf hydraulic conductance (Kleaf), and midday transpiration (E) in four temperate woody species exposed to controlled drought conditions ranging from mild to lethal. During drought the vulnerability of Kleaf to declining Yleaf varied greatly among the species sampled. Following drought, plants were rewatered and the rate of E and Kleaf recovery was found to be strongly dependent on the severity of the drought imposed. 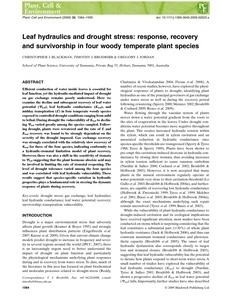 Gas exchange recovery was strongly correlated with the relatively slow recovery of Kleaf for three of the four species, indicating conformity to a hydraulic-stomatal limitation model of plant recovery. However, there was also a shift in the sensitivity of stomata to Yleaf suggesting that the plant hormone abscisic acid may be involved in limiting the rate of stomatal reopening. The level of drought tolerance varied among the four species and was correlated with leaf hydraulic vulnerability. These results suggest that species-specific variation in hydraulic properties plays a fundamental role in steering the dynamic response of plants during recovery. drought stress; gas exchange; leaf hydraulics; leaf hydraulic conductance; leaf water potential; recovery; survivorship; transpiration; vulnerability.